The easiest way to share files between your iPhone, Android, PC and other devices is with wireless storage, especially a Wireless USB Flash drive. These memory sticks work seamlessly with all operating systems (iOS, Windows, Android, etc.) and don’t require installing software or drivers. We review the best device on the market – the SanDisk Connect Wireless Stick. You can even use it just like a standard Flash Drive with the USB connection. If you really just want a Flash Drive, without the wireless, that works across multiple devices, check out our review of Flash Drives with Dual USB and Lightening Connectors. Our favorite is the SanDisk Connect Wireless Stick, with 200GB of Flash Memory. We like that you can access and save from up to 3 devices simultaneously. 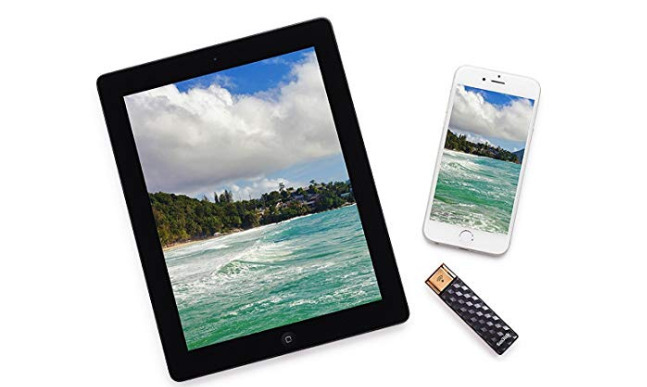 So if you want to share your latest vacation photos, you don’t have to pass around a Memory Stick. And you don’t have to worry about which devices everyone has – the wireless works with all of them. And it’s not just for copying / sharing files. You can stream HD movies and/or music to up to 3 devices at the same time. Basically, any three devices can be using the memory independently at the same time. The wireless flash drive really reinvents portable storage for your phone, tablet and computer. We would have preferred the USB port to by the faster 3.0 standard, but the USB 2.0 is still good enough for when we plug in to the computer. The USB port is really there for charging the device so that it can operate in wireless mode. The battery life is pretty good (some users even say “phenomenal”). You can expect to get about a weeks worth of typical usage. Or when not in frequent use, the battery is good for nearly three months between charges. Excellent! This works with iPhone, iPad, iPod Touch, Kindle Fire and other tablets, Android devices, PC and Mac computers – just about every device we could find. You can order these through Amazon with the links below.